In the last two installments of our Baccarat series, you’ve learned the basics of how to play Baccarat and how to score and win playing Baccarat. Now, it’s time to learn one of the more complicated parts of Baccarat- the RULES! Up to this point, everything has been fairly straightforward… you pick whether you think the Player or the Banker is going to win, you count the points, and the winner is declared. Nothing complicated about that, right? You may have noticed while practicing your Baccarat skills in the free Baccarat game from Silver Oak Casino (you have been practicing, RIGHT? :o)) that sometimes the Player and Banker will get 2 cards, and sometimes they will get 3 cards. What’s the deal with that extra card? Why does it come out sometimes and sometimes not? What does it all mean?? To understand where that third card comes from, you have to know how Baccarat hands are dealt. Both the Player and the Banker receive two cards. Depending on the cards that are dealt, the player might get a 3rd card. Depending on the Player’s and the Banker’s cards, the Banker might get a 3rd card. After both the Player and the Banker have their first 2 cards, the Player will receive a third card if his score is between 0 and 5 (zero and five) . If the Player’s hand is worth more than 5 points, the Player does not receive a 3rd card. If you don’t remember how to get the Player’s and Banker’s scores in Baccarat, see the last article about how to win in Baccarat. After the Player finishes, it is then the Banker’s turn to see if he will receive a 3rd card. Unlike the Player’s turn, it is a little more complicated to tell if her should receive a 3rd card or not. First, if the Player DID NOT receive a third card, then the Banker hits if his hand is worth 0 to 5 (zero to five ) points. If the Banker’s hand is worth 6 to 9 (six to nine) points, then the Banker does not receive a thirday card. If the Player DID receive a third card, then the Banker will get a third card as well depending on the Player’s and Banker’s points. Before you start hyperventilating, know that you do not need to memorize these rules as a player. In general, the dealer will take care of everything and you just need to be able to count up the points of each hand. However, if you have some kind of photographic memory or just love to memorize charts in your spare time, it never hurts to know all of the rules just in case your Baccarat dealer makes a mistake. 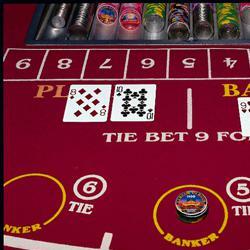 So now that you know all of the rules and know how to play Baccarat, what else is there? In the next articles in the How To Play Baccarat series, we will take a look at Baccarat strategy and odds. Why just play when you can learn how to WIN? Ready to get started playing a FREE Baccarat game? Just click on Play Now below and you will be playing Baccarat and over 130 other online casino games in just a couple of short minutes!